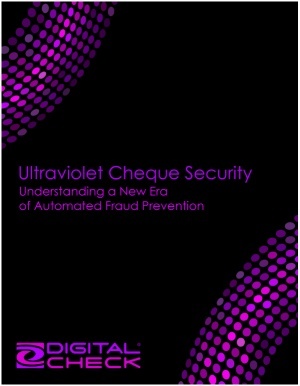 Ultraviolet (UV) ink has been used as a document security tool for a long time, but only recently have UV cameras become small enough and inexpensive enough to put in a cheque scanner. The use of machine-readable UV opens up a whole new realm of possibilities in cheque security — along with new challenges in using them effectively. This paper is intended to provide a general understanding of UV cheque security to bankers and regulators alike, in order to make the transition to an automated UV system practical and smooth. Digital Check is leading the way in UV imaging, with our high-speed TellerScan TS240-UV scanner representing the largest installed base of UV-capable cheque scanners in the world as of February 2013. To find out where our UV scanners are available in your part of the world, contact us online or visit our international resource center to locate a distributor near you.